It’s been a long time since I’ve posted my last “Special Art Post” about Willie T., so I think it’s time for another one. I’ve decided to dedicate #6 to artists SABER, because he’s one of the best graffiti artists, he completed the largest graffiti piece on the cement bank of Los Angeles River in 1997 (blood shedding included), he has probably the coolest website, and…. he’s cool. Actually this is not really an easy post to do, because SABER has done so many art pieces throughout the years and there’s tons of material on the web, including probably more interesting articles about him on bigger sites. So this post is more like a little introduction of SABER and a little summary of what you can find on the web about him. I strongly recommend to click your way though his website, blog and other pages, because there is way more stuff than I can post here. SABER was already a fixture in the Los Angeles graffiti scene, but in 1997 when he completed the largest graffiti piece ever created he was catapulted to global legend. His piece on the sloping cement bank of the Los Angeles River is nearly the size of a professional football field, and can be read clear as day from a satellite photo. It took 97 gallons of paint and 35 nights to complete. In a famous photograph—taken by his father just after it was finished—SABER stands on the piece and appears as a tiny speck amid a giant blaze of color. Born in the Los Angeles suburb of Glendale, SABER was raised by creative parents and discovered his passion for art at an early age. At 13, his cousins introduced him to graffiti when they took him to see the spray paint-covered Belmont Tunnel. And from that moment on, he was hooked. 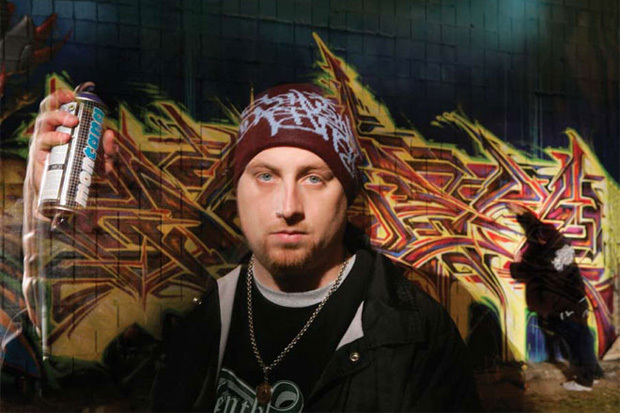 After honing his skills on local walls, SABER joined MSK, and was later inducted into legendary piecing crew AWR. While painting graffiti is his main focus, SABER also explores other artistic avenues. He is known for his surreal landscapes, which are pulled from the deep, dark places in his psyche, and has also created groundbreaking metal and wood sculptures of abstract letterforms and painstakingly rendered hyper-realistic canvases. SABER has also worked in design, taking jobs for Harley-Davidson and Levis, on movie sets and music videos, and was commissioned by Hyundai and Scion to airbrush cars. The city of Los Angeles shows their disrespect to their own history by buffing one the largest graffiti painting of all time. This particular painting was done by the graffiti writer Saber. The painting was created using rollers and it took Saber a year and a half to complete. Saber worked on it so long that he suffered a knee injury from standing on the slanted surface of the LA riverbed. California is in a recession and has been having troubles buying books for schools but had enough money to buff the LA River. SABER did tons of other pieces so you should definitely check out his gallery HERE! If you want to read more about SABER you should purchase his book “Mad Society” HERE! This engrossing monograph is not only a picture-book, but features amazing stories about childhood, life and death, fine art and graffiti misadventures proving that SABER is a multi-dimensional artist with an amazing story to tell. SABER continues to push himself as an artist creating groundbreaking metal and wood sculptures, painstakingly rendered hyper-realistic canvases, and works in many other media. As a quite untalented person, when it comes to art, videos like this always make me wonder how a person can be so talented to paint something like this.